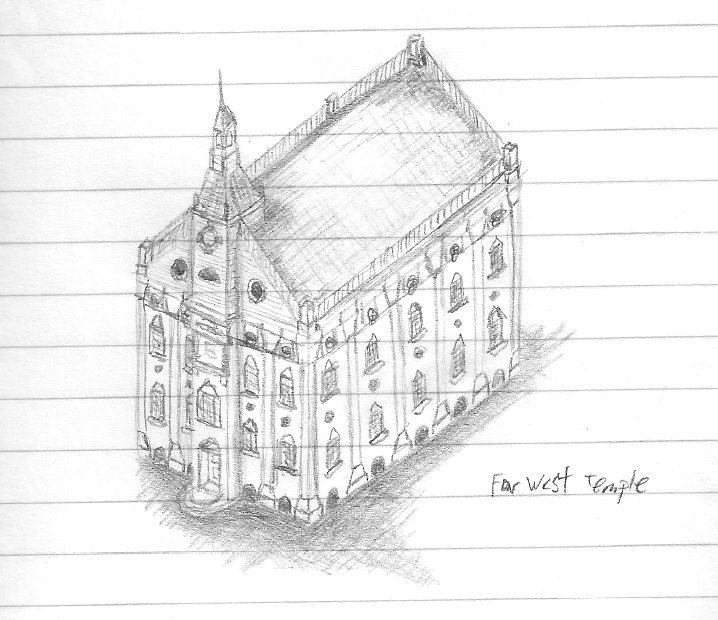 Here’s a quick sketch I did of my concept for the Far West Temple. 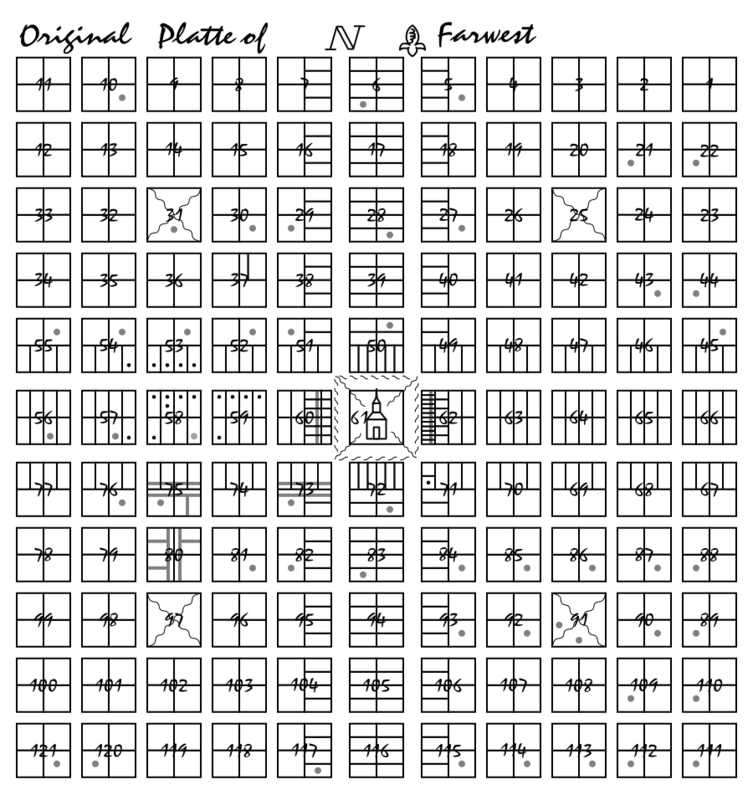 It is based off the temple drawing at the center of the plat of Far West. It has influences from the Nauvoo Temple, and the Zion Temple. I just thought I’d share with you guys. Sorry for the lines. I did it in my notebook during my institute class. Notice the theme. To cleanse yourself from the blood of this generation, you have to come out of the world (Babylon), into the very midst of the refuge from the world (Zion) and to the very focal point (in a circle or square the center is the farthest point from the edge) or the point farthest from the world. There and only there is found the most holy of hollies. Very true. There is a reason why temples were never intended to be placed willy-nilly around the world. Not to mention there was never supposed to be anything called a temple “recommend” in the first place. Since when does salvation/exaltation rest on having a piece of paper? Oh, wait, it’s used as a means of enforcing those high income rates. Sounds a lot like a certain mark spoken of in Revelation when you think about it. I guess you never had a temple recommend interview. Otherwise you’d know it has nothing to do with income but everything with commitment and a clean moral life. However the Church will only build temples in places where the income from tithing is high enough. It has nothing to do with a clean moral life. It doesn’t matter how many members of the church there are. The decisions of where to build temples is significantly(if not entirely) based on tithing. My only critique is this. You left out the 2 billion dollar shopping mall that the temple needs in order to buffer it’s sanctity from the riff raff. I agree that the “piece of paper” thing is bizarre. However, does anyone have a brief synopsis of how people did temple work originally? In other words, back in Kirtland, was there any qualification to go through that temple? Thanks for the laugh about keeping the “riff raff” out. Nothing quite like a multi-billion dollar mall to protect the “sacred” places of the church. As far as I know there were no qualifications to attend regular services in the temple. The Kirtland temple functioned mainly as a church building. Sacrament meetings, School of the Prophets, etc. were held there. There were two floors and an attic. The first floor was a general meeting hall. The second floor was the same design as the first. The attic was offices. All of these floors could be accessed by anyone without a special recommend. The Kirtland Endowment was held in the attic space and was only attended by select individuals. I believe the same held true for the Nauvoo Temple. Although Brigham Young changed the design for the Nauvoo temple it still retained the two meeting hall and attic design. There was of course the basement for baptisms for the dead. The only time a recommend was required to enter the Nauvoo Temple was for the Nauvoo Endowment. This was likewise performed in the attic space. They would just rearrange the furniture from office mode to endowment mode. Recommends may have been used for baptisms for the dead but I’m not sure. L-DS Temples today have thrown off the other functions of the temple. They are centered completely around the Endowment. The Kirtland and Nauvoo Temples housed marriages and even dances. They were a public gathering place. When we look at how the temples should be built it all makes sense. Each City of Zion was centered around temples. There were not to be any churches, civil buildings, schools, etc. (except Nauvoo). All of these roles were to be fulfilled with the temples. So, what did those recommendations for the “endowment” entail? If modern temples are principally focused around the endowment – and they are – then couldn’t it be argued that the historical precedent of recommendations is still being followed? Or, have the recommendations changed in scope and, if so, how drastically? Today we have a litany of questions, most of which have nothing to do with the temple or one’s personal spirituality. However, back then how detailed was it, if at all? Jose, what I’ve been taught is that the original “temple recommend interview” consisted of basically one question along the lines of: “Do you want to go in?” That’s it. No litmus test of testimony, no enforcement of the non-commandment Word of Wisdom, no having to pay to get in. The Kirtland temple was open to the public while the endowment originally consisted of washings and annointings similar to the ones today and were done for missionaries who were preparing to leave. No secret signs or tokens, no new names, no blood oaths. By the way, did anyone else ever notice that the first human in the scriptures to receive a “new name” was Cain? Yes, I believe the original recommend basically involved being known as a good person by a church leader. That’s an interesting observation Dave P. I never realized that about Cain. In Revelations it talks about the saints(“him that overcometh”) receiving a white stone with a new name written in it. I wonder if there is some significant parallel between a new name from Satan and a new name from the Spirit. Which of course begs the question: Abram and Jacob were given new names and they weren’t told to “never reveal them until a certain time and place,” so who is it that gives the “new names” in the temple? I’ve heard the sentiment various times that Abram/Abraham and Jacob/Israel are prototypes or examples for the “new name.” However, given that such became their public name thereafter, I cannot believe that they are one-and-the-same. Significant? Yes. Sacred to the individual? Yes. Indicative of a covenant? Yes. Parallel to the new name and it’s significance towards passing angels and gates? No. Now I’m not saying the events described here ar ethe Nauvoo Endowment. But this name too, which is given by the Holy Spirit, is only known to the person who receives it. Yes that is interesting about Abaraham receiving a new name as well. Are new names then supposed to be an actual new name? When i was younger I remember hearing people speculat that he new name in the temple is actually our name in the premortal life. Kind of makes me chuckle. I certainly hope my real new name would come via revelation not the name-of-the-day they give out at the temples today. So I have a question… I am getting ready for my primary lesson tomorrow and am doing research, and came across your blog. Are you “for” or “against” the church? I get confused. At some points (when you talk about being in sacrament or going to the stake center to listen to the prophet) I think you agree and are an active member, but then when you question every little thing (the sacrament, for example) I get confused. I don’t feel the spirit when I read any of your posts, and I think if your blog was intended to be an uplifting, insightful blog, I would feel “good” about it. So which is it? Thanks for asking. That question of whether I am for or against the Church is not a simple answer, It is yes and no. I am for the Restored Gospel of Jesus Christ and those principles of the restoration I believe to be true. I believe that the revelations(written and printed i.e. Doctrine and Covenants) from God are the standards by which we should be guided. If you’ve read my posts on revelation and prophets I don’t need to explain further about that. I believe that the members of the Church of Jesus Christ of Latter-day Saints are one branch of the whole of the church that split apart after Joseph’s death. I believe that one day we will all have to let go of our pride and belief that we are the “true successors” and unite with these other branches under the restored Gospel. I can’t classify myself as all for or all against the Church. I am for those elements that comply with God’s word. I am against those elements that do not. Now I do apologize for not addressing those issues which do comply with God’s word. I think it is often far easier to discuss differences than similarities and I am certainly guilty of that with this blog. As far as feeling the Spirit I’m not really sure what to say. I certainly do not intend for my blog to foster “warm fuzzies.” But then also I can’t really make the Spirit manifest itself through my words. Nor do I try. I haven’t been trying to encourage the Spirit through my writings. My focus was rather to encourage questions. While I do come to conclusions in many of my posts it is not my intent to pass my conclusion off as truth. It is simply the temporary understanding I reached at that point. I hope that by reading my posts others will ponder the issues I address, research them, and come to their own conclusions. A person should take what they have researched before God and ask for confirmation. That is where the answers come from. And it may be different for each person. It is not my place to dictate to another person what God must them. Likewise I hope others will respect my right to receive commandments from God for myself and to practice them. I hope I answered you questions in there somewhere. I’ve always wanted to take a group of my friends through the temple and go over the ceremonies and talk about what they may mean. I’ve pondered for hours about the ceremonies and have a ton of insight and I’m sure other have their own insights. I guess I could always ask one of the temple presidency for a vacant sealing room. Seems pointless IMO to go through a spiritual lesson then not discuss it because your interrupting someones prayers or meditation in the celestial room after a session. There are a lot of cool Easter Eggs or remnants of lost doctrines like Adam-God in the ceremonies that the Brethren have missed in the changes (otherwise they would have taken it out) that they’ve made to the endowment. One of the things that ties into that scripture Zo-mo-rah quoted. Rev 2. When you are in the endowment and give the token of your name and new name, look at how your hands are 🙂 They’re in a position to receive a small round object by oath, then if you were facing the person who gave you that object and you both gave the next sign, your hands would cover each other’s stones as a reminder not to divulge it. Gotta love it.